I haven't looked at any men's products advertisements in a long while, and this one by Lancome caught my eye. Not because of the freebie travel pouch and stuff, but because of the way they market their men's skincare line: you can choose products appropriate to the age, similar to how lots of women's skincare lines are marketed. I think this is great, and my husband would probably appreciate a product specific for his age group. 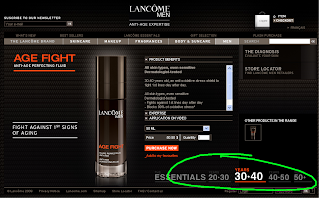 Now, if only Lancome offered more than just the 2-3 products for each age group?! Oh, and about that freebie! Just buy ANY men's skincare product and you'll receive a free travel pouch, cleansing gel, and high definition shaving foam! Plus if you purchase $85 or more, you'll get FREE SHIPPING as well as 2 FREE SAMPLES. Click here for the Father's Day special deal! Don't forget to log into your AirmilesShops.ca to get $1 for every $20 purchased. 0 Response to "Father's Day: Free Travel Pouch, Cleansing Gel, Shaving Cream with Purchase from Lancome"